Tony and Debbie Holman opened Holman Pottery in 1989. In July 1998, the Holmans purchased an 1890 Victorian home (now commercial property) to house their studio and gallery. 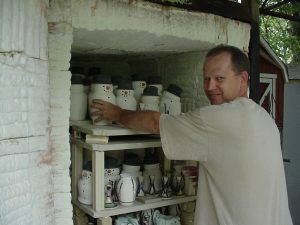 Tony, Master Potter, is responsible for design, throwing, and decorating the pottery. He has a Bachelor of Fine Arts from Indiana University (1982) and Master of Fine Arts from the University of North Texas (1986). 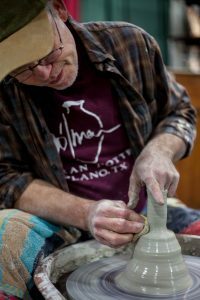 Before Holman Pottery, Tony worked for Bloomington Pottery, in Bloomington, Indiana and at Old City Park in Dallas, Texas. Debbie handles the business operations, finance and marketing. In addition, she helps with some steps of pottery production and design. 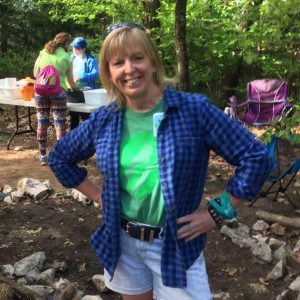 She received two Bachelor of Business degrees from Texas A&M University in 1985. Their daughter, Maggie, although no longer living in Plano, still helps in her free time with sales and marketing. Tony throws most of the pots on a potter’s wheel. Others are slab constructed and altered. When the pots become leather-hard (halfway between wet and dry) handles are added and each piece is signed. Upon becoming completely dry, the pottery is loaded into a gas kiln. These pots are then fired to a temperature of 1830 degrees Fahrenheit. 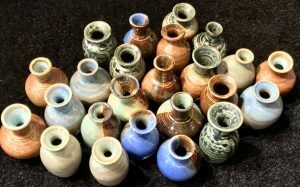 Upon unloading the kiln, they are glazed and some are decorated with colored clays (slips) and oxides. They are then fired a second time to a temperature of 2336 degrees Fahrenheit. These extreme temperatures ensure the durability of the pottery. The shapes of Tony’s vessels are functional but can simply be decorative. Because Holman Pottery is hand crafted, no two are exactly alike. Therefore, the variations of color, texture and shape lend to the artistic nature of this pottery and should by no means be considered defective. Holman Pottery is sold and collected both nationally and internationally in specialty gift stores, museum stores, and galleries.